If you haven’t bought a lawn mower after your decade-old one broke down, chances are, you would be up for a ride with sweet-talking online sites. We tried to pick the best self propelled lawn mower for your buck! What to look for in the top rated self propelled lawn mowers? Did you know that sellers get a huge chunk from the total price of each? And how did you know that you really need one? If you have previously opted to buy a push mower, how does it fare with the best rated self propelled lawn mower? Is there any difference when it comes to functionality? Briefly, the best self propelled lawn mowers do not require much effort to keep your lawn lush and even. Below are several top lawn mowers as in top of the line models that can help you in your search for the ultimate lawn mower to date. They will do the mowing for your lawn no matter how big it is without hassle and in no time. To top or trim the edges, use the best cordless grass shears. For all other jobs, the best self-propelled lawn mower which fits your budget will pull its worth! To make mowing larger lawns an effortless task, go for the best riding lawn mower that fits your budget. What you need to look for is a powerful engine, ergonomic design with great maneuvering capabilities, adjustable handles and the cutting with to suit your needs. Low-maintenance best self-propelled mower with robust steel construction and solid wheels will make the mowing tasks a walk in the park! To sum up, read our self propelled mowers review of each best self propelled mower we covered and take your pick! 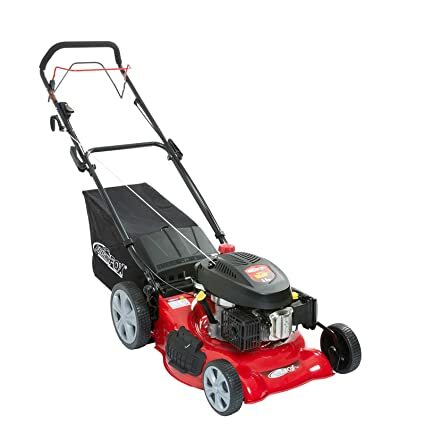 With mulching capability, the front-wheel drive Craftsman self propelled lawn mower is operated by a powerful Briggs & Stratton engine with a displacement of 163cc and owns a cutting width of 21”. Its deck is made of steel and has 8” front wheels while the rear wheels measure 11”. This machine has a pull and electric start. It is capable of side discharge but a rear discharge is not included in its features. It has a minimum cutting height of 1.25” and a maximum of 3.75”. All Craftsman self propelled lawn mower reviews agree that this is probably the best unit on the market to date! The rear wheel drive 66-lb. Lawn Boy 17732 model is a CARB-compliant self propelled lawn mower that has a 21” mow deck that goes with an enhanced traction and easy maneuver capability. It is a rear wheel drive unit that features 2-speed variants. It has a triple discharge characteristic which allows users to mulch grass, collect clippings and bag them, and can do side discharge. According to Lawn Boy mower reviews, this model is the best, hassle-free and efficient mower in the series! Lawn Boy 17732 is a no-tool machine and only takes a minute or less to change speed. It has a tri-cut blade system which can reduce the surface area less compromise of cut quality. Height adjustment is from 1.25” – 3.75”. This 144cc 6.5 gross torque/OHV Kohler Engine provides you with a 3-year Tru-Start warranty upon purchase. This cordless lawn mower runs on a removable 36v lithium ion battery and has a 19″ 3-in-1 deck that can mulch, bag, and rear discharge up to a third of an acre. It instantly starts using a key and by pulling the handle. With a single lever cutting height adjustment of 1.5” – 3.5”, precision cutting experience is expected. Folding it upright for storage is easy with its compact design and its featured high-impact polymer deck can last for years, at least according to the most self propelled mower reviews of this ubit. It is fitted with soft grips and easy handle height adjustment for user convenience. The Personal Pace unit from Toro is a self propelled super recycler and among the top selling units for 2016. It features the manufacturer’s premium 7.0 ft-lb torque OHV engine and Auto Choke that would not require you to prime or choke. Just like other units of its kind, it matches your walking speed. With a veneered 21” cutting blade, kickers, and clipping accelerator, this model will surely find itself at the top of toro self propelled mower reviews. A final perk, it also comes with a 5-Year Full Coverage warranty. This 17” stroke rotary petrol self propelled lawn mower earned rave reviews from many users due to its amazing features. It has a large 40-litre capacity, a 3.75 hp engine, and cutting width of 17”. Its 5-level cutting height ranges from 25mm – 70mm while the mower comes with is fitted with large wheels for convenient gripping while in operation. With a robust steel construction and adjustable drive speed control, it also features 3-in-1 characteristic that is sought after for gardening tools. It weighs 17 kgs. and easy to navigate. To add to its total user experience, it is fitted with padded handles. 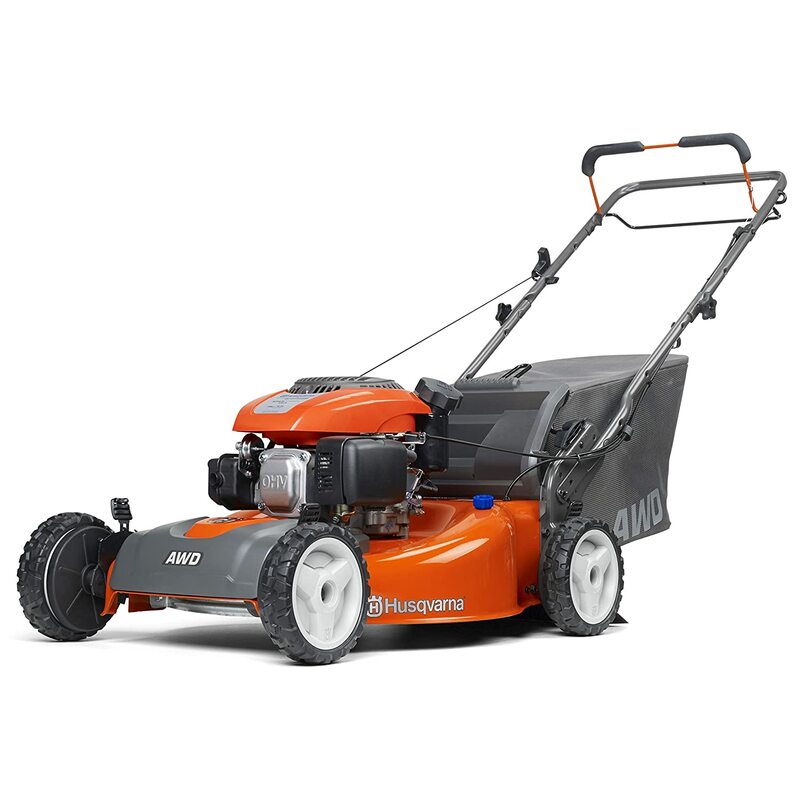 This Husqvarna model performs 3-in-1 characteristic which is the best feature any user want to see in their self propelled lawn mower. 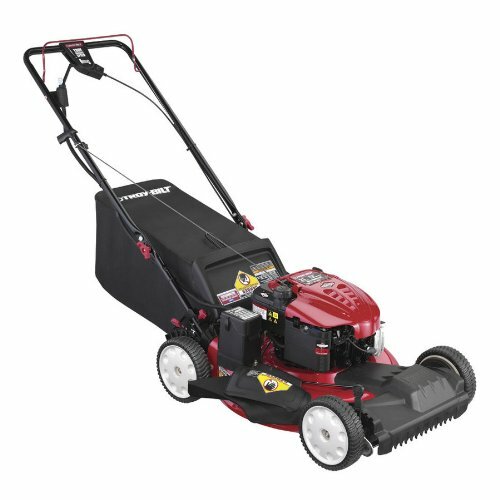 It uses Briggs & Stratton 725 engine powerful enough to deliver big blows on its grass cutting tasks. With a cutting width of 22”, this all-wheel drive pull-start mower also features 163cc engine displacement. Its front wheel size is 8” and rear wheel size is 11”; all premium rugged treaded tires. This unit has a sturdy steel material for its deck and capable of clean-up. It also comes with a 4-point quick pin wheel height adjustment with 9 settings and carries a 3-year limited consumer warranty. However, warranty is voided if the machine is used for commercial or promotional purposes. 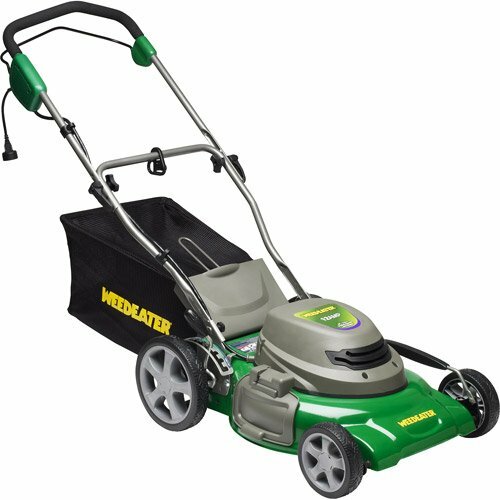 The 20” Weed Eater operates on a 12 amp power and considered as one of the best 3-n-1 electric lawn mower on the corded category. It can discharge, cut and mulch which makes it very helpful equipment around the garden. It has 7” front wheels and 10” rear wheels to boot, and a 7-position height adjustable single lever. Its huge cutting deck adjusts to users’ grass height preference without a fuss. The powerful engine helps realize consistent cut without worrying of the mess. Additionally, there is no extra cost of fuel. It includes mulch, side discharge, and rear bag comes with an ergonomic handle. The Frisky Fox PLUS 20” goes with the best petrol lawn mowers list for so many reasons. This 38-kg machine owns a powerful combination of characteristics that all would be users are looking to have. Owning a 5.5 Hp engine with a 4-in-1 feature makes it an above average petrol lawn mower. With enormous power plus an impressive 20” cutting width it makes it more appropriate to use for large areas. It can easily mulch, collect, and cut and likewise perform side discharge. Cutting height is adjusted by means of a single lever and its grass collection bag can accommodate a good 55 litres. This product comes with a lawn striper and an engine speed control. The 190-cc 21” electric start self propelled Troy-Bilt TB280 ES is a front wheel drive 3-in-1 gas-operated lawn mower with mulching capability. Its electric-start feature serves to eliminate pull-starting by a mere push of a button. Finding the perfect speed for you is easy with its variable speed options and its Advanced TriAction™ cutting system is equipped with a rake bumper for lifting grass upright. TroyBilt tb280es has a uniquely designed blade to allow for finer mulch while it sports a symmetrical deck that offers superior grass flow and acts to eliminate clumping. It also has a dual lever adjustment that provides you with 6 cutting height choices. In our Troy Bilt lawn mower reviews we'd like to remind you that the deck wash port can be connected to a garden hose to clear out grass clippings under the deck. Troy Bilt mower reviews also praise the features included: a mulch kit, a side discharge chute, and a rear bag to collect clippings. Overall, the best self propelled gas lawn mower for the money! 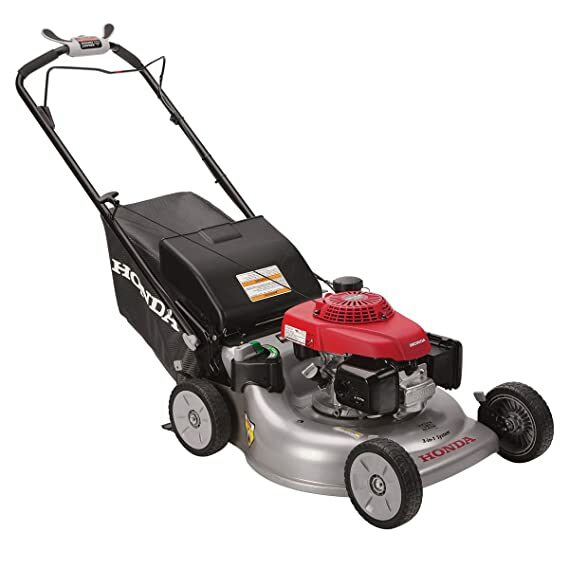 This Honda model is a 3-in-1 self propelled gas mower with variable speed of 0 – 4 mph and features the ever efficient Auto Choke and Smart Drive. It is equipped with micro-cut twin blades that can precisely cut through different types of grasses. It can bag, mulch, and discharge and there is no need for attachments or tools to do the job. It has a 12ga steel deck and powered by easy to start GCV160 engine. EPA and CARB compliant, this mower also features a 2-position foam grip handles and can fold easily when not in use. Take note that it has 8” ball bearing wheels that helps you in navigating it towards areas you want to cut through. Cutting height varies from 1 1/8” – 4”. It is capable of manual fuel shut off and has a zone start safety system that stops the engine once you let go of its flywheel lever. With all the features listed above, you might have come up with the best decision. Just remember to think of the purpose you would want to use your self propelled mower for in order to get through with the selection. For hilly terrain, we recommend best mowers for hills. If any of the lawn mowers we reviewed got sold out in the meantime, we'll replace them with equally good models for you to choose from. If you're looking for quality landscaping tools, read our best electric hedge trimmer reviews. 2 What to look for in the top rated self propelled lawn mowers?